Can I Get Rid of Payday Loans in Bankruptcy? Payday loan companies offer a short-term loan of a few hundred dollars which will be repaid on the borrower’s next payday. To obtain the loan the borrower usually writes a post-dated check to the lender. Often the payday loan lender will require a statement that the borrower is not considering bankruptcy, and, sometimes, that the borrower will not file bankruptcy in the future. Promises to not file bankruptcy are not enforceable contract provisions and are considered void against public policy. However, if a person falsely represents that he or she is not contemplating bankruptcy to obtain a loan, the debt may be determined non-dischargeable in bankruptcy and the person may have committed a criminal act of stealing by obtaining the loan under false pretenses. Many individuals worry that they will face a criminal bad check charge when they are unable to pay the post-dated check. With a few narrow exceptions, being unable to pay the payday loan check is not a criminal act. It is important to note that the post-dated check may still be presented for payment even after the bankruptcy has been filed, resulting in significant bank fees. Most courts addressing the issue have stated that the presentment of the post-dated check does not violate the automatic stay provisions of the Bankruptcy Bode. However, courts have said that the funds collected by the payday loan company may be an avoidable post-petition transfer under section 549 of the Bankruptcy Code, meaning that the debtor may get that money back. A person who takes a payday loan after meeting with a bankruptcy attorney may be asking for trouble. 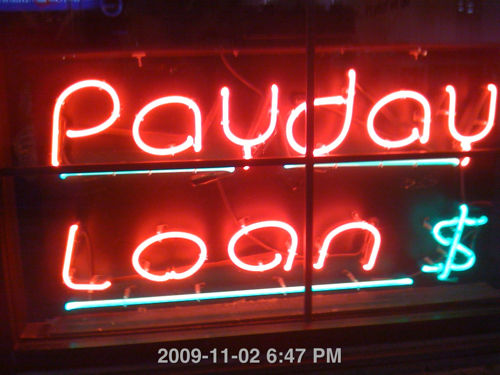 Payday loan companies are usually locally owned and are notorious for pursuing their money. Of course, the lower the dollar amount, the less likely the company is to pursue legal action. Payday loan companies may file criminal charges when the loan was made within a few months of the bankruptcy or if there is evidence you took out the loan after you met with a bankruptcy attorney. Local prosecutors are usually very reluctant to get involved in payday loan cases because they consider these companies shady, the loan a civil matter, and generally do not understand the bankruptcy process and its effect on the loan. The easiest action to stop the payday loan nightmare during bankruptcy is to work with your bank and stop payment on the post-dated check. An inability to pay a post-dated check is a civil matter, not criminal. The Electronic Funds Transfer Act (“ETFA”) also provides certain important consumer rights. You have the right to stop pre-authorized electronic transfers up to three days before the transfer is scheduled by notifying your bank. It is always best to notify the bank in writing. If the bank allows an electronic funds transfer despite your stop payment, you must then notify the bank within 60 days. The bank then has ten days to investigate and one more day to put the money back (including any overdraft fees). The ETFA prohibits lenders from conditioning the extension of credit on a requirement that periodic payment loans be repaid electronically, but some payday lenders exploit a loophole in the ETFA by issuing loans that are due in full in one payment. It is important to note that some states make it a crime to close a bank account or stop payment on a payday loan check. If your state law prevents you from issuing a stop payment on the check, you may have no other option than to open an account at another bank and discharge the overdraft fees caused by the payday loan check. For more information or a free consultation, contact the experienced attorneys at Fears | Nachawati Law Firm at 1.866.705.7584 or send an email to fears@fnlawfirm.com.